… Note how each contour has a double function: a single line borders the mane as well as the belly of the horse; also the face of the rider as well as the neck of the animal are defined by one and the same line. An actual example of such duality is illustrated left and below, using my favourite tessellation, of Human Figures, No.1. The figure on the left shows the girl motif tessellating tile in isolation, thereby aiding the discussion without 'distractions' of contiguous figures of the plane tessellation. 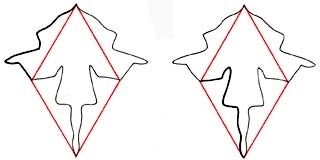 The two figures here show the construction and duality of the outline. Essentially, this drawing, i.e. the outline (the interior design being in the strictest sense 'decoration') consists of a single line, rotated 60° at the vertex of a rhombus, and then as a unit reflected over the long axis of the rhombus. 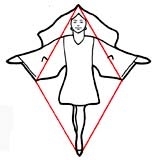 Duality is shown by the emphasised line diagrams of this figure, with the emphasised line of the left figure represent the girls' hair, arm and hand, whilst the emphasised line of the right figure represents the dress, waist and leg.Now, from this, it can be seen that aspects of this are of more fundamental importance than others. For example, the line representing the waves of the hair is not vital as regards its veracity – the undulations do not need to be of specific nature. However, when the line is rotated, this now represents the contours of the entire length of the leg, of which such a shape is indeed of a more specific nature, of necessity an exact shape. Consequently, of these two aspects, by far the most important in terms of portraying the girl most realistically is that of the leg, and so more attention is thus paid to this in terms of anatomical accuracy for the sake of the inherent quality of the motif.